Where is Christ Lutheran Church? We are located on the corner of Taylorsville Road and Six Mile Lane, just past the Stonybrook Shopping Center. What type of church is Christ Lutheran? We are a member of the Indiana-Kentucky synod of the Evangelical Lutheran Church in America (ELCA), one of the largest Christian denominations in the United States. For information about the ELCA, please visit www.elca.org. What is Christ Lutheran Preschool? 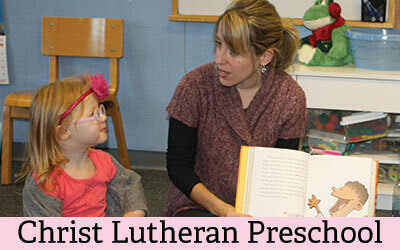 Christ Lutheran Preschool offers a variety of learning experiences for children ages 3 and 4. The Preschool operates from the last two weeks of August through the first two weeks of May. Teaching is success oriented, based on each child’s needs, and developmentally appropriate. We use a literature- and theme-based curriculum with lots of fund opportunities for hands-on learning. For more information or to schedule a visit, call 502-267-5082 or go to www.christlutheranpk.org. VBS is a free, week-long experience for young children with activities such as singing, dancing, crafting, playing games, learning cool Bible stories and of course, eating yummy snacks — all in the name of Jesus! Our 2018 Vacation Bible School, titled “SHIPWRECKED: RESCUED BY JESUS 2018,” is tentatively scheduled for June 11-15, 2018, 9am-12pm.